This paper proposes a dissimilarity function that is useful for analyzing and learning the opponent’s strategies implemented in a RoboCup Soccer game. The dissimilarity function presented here identifies the differences between two instances of the opponent’s deployment choices. An extension of this function was developed to further identify the differences between deployment choices over two separate time intervals. The dissimilarity function, which generates a dissimilarity matrix, is then exploited to analyze and classify the opponent’s strategies using cluster analysis. 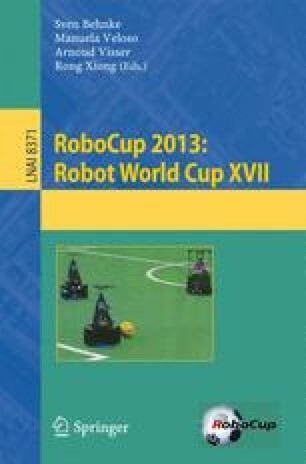 The classification step was implemented by analyzing the opponent’s strategies used in set plays captured in the logged data obtained from the Small Size League’s games played during RoboCup 2012. The experimental results showed that the attacking strategies used in set plays may be effectively classified. A method for learning an opponent’s attacking strategies and deploying teammates in advantageous positions on the fly in actual games is discussed.